The Donau Festival is an art festival that has been held since 1991. 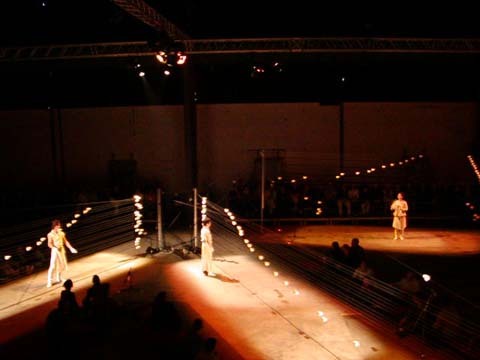 It is composed of a variety of programs that range from classical concerts to contemporary dance to theatrical performances. Artists from various genres are invited to this festival from around the world. 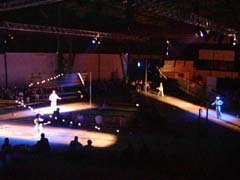 For the 2003 Festival, thirty-three productions were held through the support of many corporations. 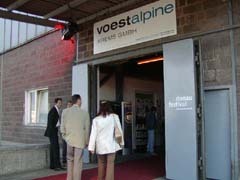 The venue we used for our concerts was in one of the factories of a steel company, VOEST ALPINE, which normally prohibits public entrance into its premises. This venue was located in a beautiful city along the Donau River called Krems, which was about an hour-and-half drive from the airport in Vienna. The Stringraphy Ensemble Concerts were held during the last three days of the three-week Festival. Before our concerts were held, we were told that the tickets were nearly sold out. It might have been because the Stringraphy was such an unusual instrument, but we were well-accepted at the Festival. We also heard that the audience would be coming not only from Vienna, but from various other places. 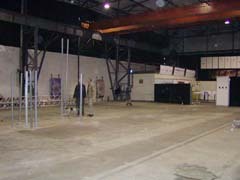 As was the case with the venue of our Nantes Concerts in France in 2002, the venue for this Festival was a large factory building (thirty meters in length and width), with a ceiling over twenty meters high. By making full use of the large space, we were able to create a three-dimensional instrument whose appearance was transformed depending on the angle from which it was viewed. Because VOEST ALPINE was a steel factory, it produced perfectly functional and beautiful steel-pipe stands for us, which are indispensable in setting up the Stringraphy. Every single member of the Austrian staff was tall. 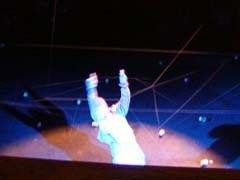 We made previous arrangements with the Stage Manager, who looked to be twice the height of Mizushima. The sound and lighting technicians were also quite tall. Compared to the way most Japanese work, Austrians seemed to be more optimistic about getting their jobs done. So, we decided to go along with the European style, thinking that "waiting" was a part of our job; thus, we had coffee while we waited for them to finish the preliminary work. 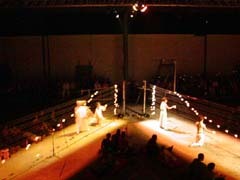 Once the lighting was prepared and the stands were put up for us, it was our turn to take over. The Stringraphy Ensemble members moved unbelievably fast at stretching the strings. The instrument was set up while I looked on in blank amazement. It made me laugh to witness the sight of the small Japanese members working as if they were worker bees or ants. After spending two days on the preparations (run-trough, lighting and adjustment, sound testing and retesting, and then a dress rehearsal), it was finally time for our first-day concert. 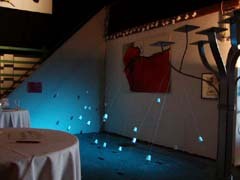 At the entrance, a table was prepared for the bar, and in the corner, a small, twenty-string Stringraphy was installed just for the audience to play as they wished.